Fife Flyers 1977-78 - the team collect the Slapshot Trophy which was on offer to promote the legendary ice hockey film which had just been released, starring Paul Newman. They beat Murrayfield Racers in a game televised by Scotspsort on STV, and shown on Boxing Day. Delivering a Grand Slam is precious. Following it up has to be one of the biggest challenges in sport. Fife Flyers claimed no fewer than seven trophies in 1976-77, making them the undisputed kings of the Northern League. Fife Flyers - 1976, Les Lovell receives the Skol Trophy from Ian Crichton, area representative from the sponsors. They returned after a summer break to retain much of that silverware in another hugely successful season littered with free-scoring games and more than a few landmarks. The team of 1977-78 was again entirely home based, despite the arrival of some Swedish skaters across the NIHA. Their presence was expected to make things even more competitive. Flyers went with players they knew and trusted. The roster was packed with familiar names. Two Lattos, Dougie and Gordon, and two Cottrells, Willie and Chic, plus a pair of Lovells – Law and Les. Add in Jimmy Jack, Gus Cargill, Jim and John Taylor, Brian Peat, Kenny Horne and Ally Brennan and you had the core of a very talented team. Joe McIntosh had hung up his skates in summer, but the door opened for the return of an old-timer, Jerry Hudson, who previously iced with Dunfermline Vikings and Falkirk Lions and, as recently as three years before, he was playing in the Italian Division Two. His hopes of lacing up in Fife colours again were dashed by injury in training which made the move impossible. As he withdrew, so did Dundee Rockets, victims of rising running costs and a home rink that showed no interest in welcoming ice hockey back. That loss enabled Flyers to add a young Charlie Kinmond to the team,and, bolstered by pre-season games against Aviemore Blackhawks up north, they hit the ice keen to pick up where they had left off the previous season. And they did – a 9-7 blitzing of Whitley Warriors which saw them rifle three goals in 56 seconds to take the points. Chic got the first hat-trick of the season – and there were maay more to come from this team. Law Lovell netted three in the first road win of the new season, Durham Wasps beaten 8-5. 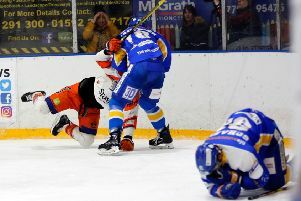 Warriors were then swept aside 12-9 on home ice before Glasgow Dynamos came to town and were thumped 9-7 in a bruiser of a game which saw a couple of fights, a Gogs Latto hat-trick, and Brennan sustain arm ligament damage. Law Lovell and John Taylor then joined the hat-trick club in an 11-5 defeat of Ayr Bruins in the Autumn Cup, and, not to be outdone, Kinmond followed suit in a 12-1 demolition of Durham. That game, in mid-October, was most notable for an incident which saw defenceman Brian Peat throw his stick to the ice, sending a player reeling. He got a match penalty for his efforts. More importantly, he was suspended until the next NIHA meeting at which the Referees Association demanded protection for players, and the administrators suspended him until the end of January! The club’s 100 per cent record went at the hands of Murrayfield, thanks largely to former netminder John Pullar standing on his head for a 4-2 victory. Racers were a bit of a bogey team as they then came to Kirkcaldy and won 7-5 in the Autumn Cup – a match watched by over 2000 fans. Jimmy Jack hit three for Fife, Derek Reilly got five for the Edinburgh side. Not to be outdone, Law Lovell netted five in a 13-5 destruction of newcomers Billingham Bombers, but, by then, Fife’s Autumn Cup hopes were fading. The goals still flowed – 19 against Ayr summed up Fife’s dominance and firepower. December saw them go head to head with Racers in a one-off competition for the Slapshot Trophy to mark the launch of the new movie which starred Paul Newman and the legendary Hanson Brothers. The film’s distributors put up some silverware, and Scottish Television filmed the action for broadcast on Scotsport on Boxing Day. Fife won 3-1 for their first silverware of the season. The domestic season was then put on hold for a Scotland-England game staged at Kirkcaldy Ice Rink–a landmark game the Scots won 15-4, breaking a 30-year losing streak with a record score in the process. The game was watched 2100 fans. They then won 7-4 in Edinburgh and 9-5 in Glasgow to underline their place at the top of the Northern League. They dispatched Ayr 13-1 – the third time they’d hit a baker’s dozen during the season – before experiencing something unique, defeat. Whitley Warriors skated to a 7-3 home win, inflicting Flyers’ first league loss in two seasons. Kenny Horne also sustained an injury many feared might be season ending. A 2-2 tie with Racers followed with Dougie Latto netting the equaliser just 15 seconds before the final buzzer. A 7-4 win followed in the Skol Trophy – a typically tough derby which saw sole referee Tom Watt struggle to stay on top of things. No sooner had he sorted out a set-to between Brennan and Lann than netminder John Pullar and Jimmy Jack got involved in a stick swinging incident which must have come close to match penalties for both. Back on the goal trail, Billingham crashed 16-3 on home ice, Ayr capitulated 14-2 – Jack got a double hat-trick – and Durham 8-1. 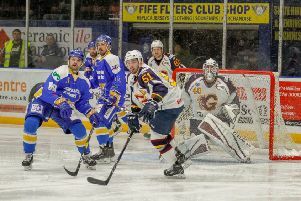 More followed – 9-4 Icy Smith Trophy win in Whitley secured Fife’s place in the northern section final against Murrayfield. The Northern League title was formally retained with a 17-6 romp over Glasgow – Law Lovell five goals, Jack and Kinmond hat-tricks – but Dougie Latto was an absentee following a car crash. The match was also notable for some misconduct penalties and a note in the Fife Free Press report of “crowd interference causing a delay” but with no further details given. With the title wrapped, Flyers added the British title – the Icy Smith Trophy – with ease. A 13-0 first leg whitewash of Southampton Vikings put the issue beyond doubt. It was, said the Press, one of the mismatches of the season. Vikings coughed the second leg 10-5 with Law Lovell completing his ninth hat-trick of the season. For brother Les, it was the end of his career as he hung up his skates after 20 seasons to a standing ovation from the crowd. He also marked his retiral with a goal in the Skol Trophy final – a 6-3 win over Racers – to take his NIHA points haul to over the 900 mark. A fitting finale to a hugely successful season which yielded a league title and three other trophies. The track record of Flyers’ home-based teams of the 1970s continues to stand comparison with any in the 80-year history of the club. In this landmark anniversary they deserve to be honoured.